William Morva is a Virginia man who suffers from delusional disorder. The jury in his sentencing trial never heard about his severe mental illness, but Virginia is set to execute him on July 6. Send an email to Virginia Governor McAuliffe today and ask him to grant clemency to William Morva. It was only after Morva’s trial that a forensic psychiatrist evaluated him and took his complete psychiatric history. Prior to that, no one knew the full extent of his illness. Delusional disorder makes it impossible for Morva to distinguish between reality and his delusions. He was operating under these delusions when he committed his crime, and to this day he believes he acted in self-defense and that anyone in the same situation would have done the same thing. His sentencing jury was never given this information. William Morva should have received treatment, but he never did. We should ensure that people with serious mental illnesses receive the treatment they need so crimes like this can be prevented from happening in the first place. Executing someone with a serious mental illness is an affront to justice. 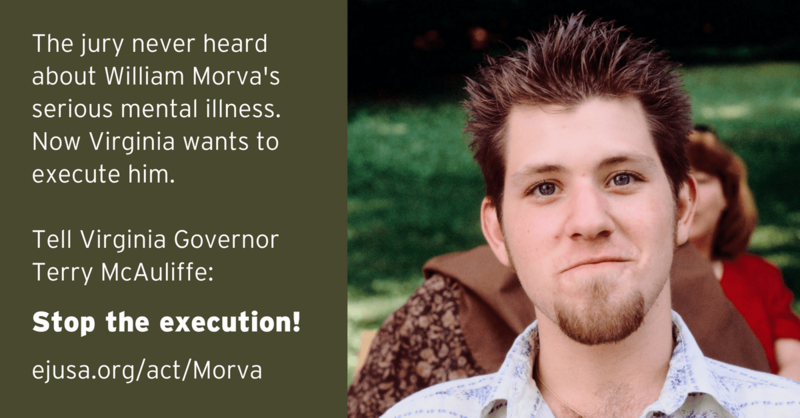 Tell Governor McAuliffe to do the right thing: grant William Morva clemency and ensure he receives appropriate medical treatment for his serious mental illness. After you’ve sent your message, be sure to share the action with your friends to expand our reach and ensure the Governor hears from as many people as possible.